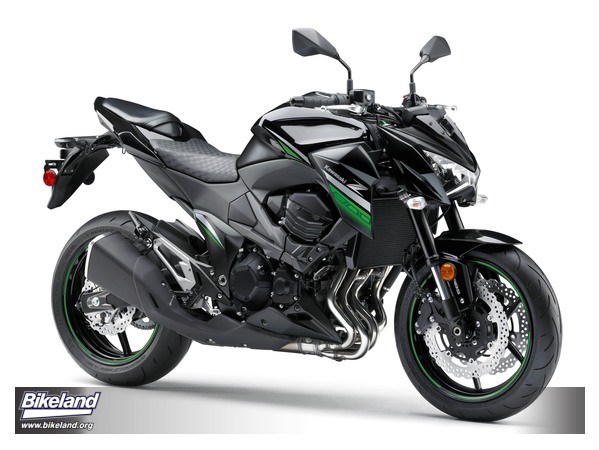 Expanding its naked bike options for 2016, Kawasaki now offers an 800CC version of the Z1000. An existing model in other parts of the world, it is now available in the US too... well, except for California. Its big brother, the Z1000, isn't left entirely out of the party, as it gets an assist and slipper clutch for 2016. The 806cc, DOHC, liquid-cooled, 16-valve engine boasts strong performance in the mid-range where most street bikes spend their time. Its fuel injection system combines ultra-fine injectors with 34mm Keihin throttle bodies and sub-throttles that offer smooth response across the rev-range. It also has two different length intake funnels to optimize airflow at various engine speeds, providing good response, no matter what the speed. The exhaust system has large radius curved header pipes to make them as long as possible, while equalizer tubes connect header pipes 1 and 4 as well as 2 and 3. Both these measures are designed to provide superb low to mid RPM engine response. An exhaust valve is positioned upstream of the muffler entrance to help “tune” the back-pressure waves for enhanced response in the same low-mid range. Finally, a short-style exhaust system eliminates the center pipe and uses a short muffler to aid mass centralization and present a strong streetfighter image. The muffler’s complex cross-section allows good lean angles while meeting the necessary noise regulations, although it has been tuned to give a more aggressive sound to suit the motorcycle’s character. For durability, the engine uses wide radius crankshaft journals as well as large 1.2mm piston-cooling oil jets and a low-friction camshaft chain to reduce operating friction. In the smooth-shifting six-speed transmission, short overall gearing complements the responsive engine to deliver impressive thrust on command. When the road opens up, the stylish streetfighter can stretch its legs thanks to a tall sixth gear that maintains a more comfortable cruising RPM for highway riding. to right), again providing ideal frame rigidity, particular in torsional rigidity for increased handling stability. Kawasaki engineers then used a combination of rigid and rubber mounts so the chassis delivers a planted feeling with a high level of feedback. The result is a superb level of control, with the rider easily able to understand what the bike is doing. Building on this sturdy platform, the chassis geometry has resulted in nimble, responsive handling together with great stability. The motorcycle’s stance is forward leaning, with the rear raised slightly to further contribute to the aggressive posture of this muscular streetfighter. Suspension duties are handled by an inverted 41mm KYB fork up front. It is adjustable for rebound damping and preload, allowing the rider to fine-tune the characteristics to suit their favorite roads. At the rear, the Kawasaki Uni-Trak® suspension system includes a KYB shock with a piggyback reservoir. Like the front, the stepless rebound damping adjuster allows the rear shock’s performance to be tuned to match changes to the spring preload or passenger loads. The 2016 Kawasaki Z800 suspension has been set up so that whether you’re hammering along deserted back roads or prowling pothole-infested city streets, the motorcycle will remain poised, predictable and entertaining. The brakes on the Z800 include dual opposed four-piston front brake calipers offering progressive stopping power and feel. The system uses 277mm petal-type front rotors and a lightweight Nissin ABS unit. A 216mm petal-type rotor and single-piston caliper provide good rear brake feel for maximum finesse. The power and progressive feel of the brakes at both ends provide supreme confidence when slowing the bike from speed. The Z800’s standard anti-lock brake system (ABS) promotes additional confidence when riding in slippery conditions. The wheels are six-spoke supersport-style units manufactured using the latest lightweight production technology. Not only do they help reduce unsprung mass, which allows the suspension to function better, but also carry the latest Dunlop Sportmax D214 radial tires. The result is superb grip, precise handling and extended tread life. The sculpted styling of the Z800 is one of its most stunning aspects. The thin, compact headlight cowl was positioned as low as possible, extending the line that starts from the top of the tank and drops down to create a menacing “face” with its angular lines. The fierce appearance is one of the key styling elements of the aggressive design. From the side, the curvature of the upper engine shrouds combine with the chiseled lower cowl to create a distinctive shape. The designers intended for these parts to appear to grip the engine, creating the image of a predator holding prey in its mouth. 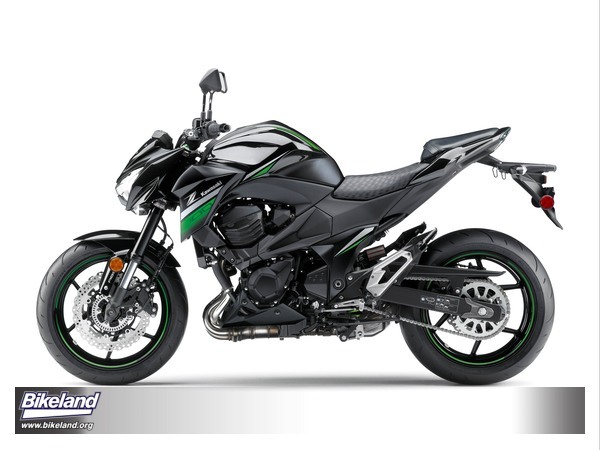 The visual weight of the front is contrasted by the sleek rear, which features a slim tail section, contributing greatly to the Z800’s aggressive mass-forward stance. And finally, the narrow proportions of the LED tail light add visual interest. Although not strictly a styling element, the Z800 incorporates useful luggage hooks. These can be found on the neat design of the rear footpegs, as well as behind the license plate holder. Both sets of hooks allow luggage to be secured using tiedowns or bungee straps. a “naked” motorcycle, especially with their “buffed” finish that bring added visual interest. Other streetfighter elements include the handlebar, which has a flatter bend than a sportbike handlebar, and the risers ensure the grip position is wider, giving the rider more leverage and allowing an upright yet sporty riding position. Details such as the inner rear fender are another clue to this motorcycle’s purpose, helping to keep the under-tail and rear suspension less cluttered, more pared down, as a streetfighter should be. It all adds up to the perfect style and ergonomics for maximum agility without sacrificing comfort. The Z800’s futuristic looking instrument panel features three LCD screens in an angular housing that echoes the motorcycle’s edgy styling. The central LCD display contains an altimeter-style tachometer. In fact, three tachometer display patterns are available, allowing riders to customize the display to suit their preference. In addition, there is a speedometer, odometer, clock, dual trip meters, engine temperature, fuel gauge, remaining range, as well as an Economical Riding Indicator. The latter illuminates when the user is riding efficiently, reducing the motorcycle’s fuel consumption and increasing its range. The 2016 Kawasaki Z800 is equipped with a standard electronic immobilizer, which is built into the standard ignition key. The key operates conventionally, but the engine won’t start without the correct key being used. The system is fully integrated and requires no additional action from the rider, but will help to protect the motorcycle from theft. subframes, providing added frame torsional rigidity for increased handling stability.